Do you have a good fogless shower mirror? Shaving in the shower helps improve the overall experience, but you need a good mirror to make that happen. Without a quality fogless mirror, you can have more problems than just missing a few spots. You might impair your vision so much that you injure yourself! In order to select the best fogless mirror that will meet your needs, you need quality information. You need to be able to compare and contrast different models. This chart below will help you do just that! What Is a Fogless Mirror? Have you ever noticed that your mirror tends to turn opaque when you’re taking a shower? Even if you have your bathroom fan on, the heated moisture in your bathroom will create a vapor covering on your mirror that makes it impossible to use. This requires you to either open up the bathroom door, which gives you the chills after a hot shower, or constantly wipe the condensation off of the mirror. Fogless mirrors prevent this from happening because they are designed to receive extra heat in some way. This extra heat prevents condensation from settling on the mirror’s surface because it is warmer than the water vapor in the surrounding environment. This gives you the opportunity to always have a clear reflection, even when you’re standing in the shower! The traditional fogless mirror is powered by an electrical current, kind of like what you’d see on the back window of your vehicle. The current heats up the mirror and this causes the condensation to disappear. You can’t have electrical currents in the shower, right? So a fogless mirror that works in the shower is heated by the hot water so the surface stays warm and clear. Many of these fogless mirrors will hang directly from your faucets. They are lightweight so you don’t have to worry about pulling your plumbing out of place! Some also may affix to other locations in your shower and there are even a few handheld options on the market today as well. Your job is simple: figure out the style that you want to have and then choose the best one that combines quality and affordability that works with your budget. What Are the Advantages of a Fogless Mirror? The primary advantage of a fogless mirror is that it allows you to let the environment of the bathroom work for you instead of against you. The natural heat of the water vapor around you increases the circulation of blood near the skin and creates softer skin that is more receptive to the shaving process. The hydration also allows the shaving process to remove dead skin cells during the process so that you’re essentially giving yourself a cosmetic beauty treatment at the same time. The bathroom is also the one place on this planet where time tends to stand still when you’re in there. Many of today’s fogless mirrors contain a handy clock on the mirror so that you’ll always know what time it is. That way you won’t have to worry about being late for work, making it to your appointment, or having your kids stay in the shower too long and be late for school. A fogless mirror will also help you save a lot of time during your morning routine because you won’t have to make separate stops to get your beautification work done. You won’t have to stand at the sink to shave because you can do it in the shower. You can quickly get groomed, get your clothes on, and make a few minutes to add something beneficial to your routine, like meditation or breakfast or even just a little extra time with the family. The final advantage is that you won’t have to freeze by opening your bathroom door just to use the mirror. To maximize the benefits of these mirrors, try having one in the shower and another affixed to your regular mirror in the bathroom so you can keep the goosebumps at bay. The best fogless shower mirrors have a few good features to them that you’ll want to look for during the shopping process. Width. A good fogless mirror needs to be wide enough so that it can reflect back to you the entire surface area that you need. Otherwise you’ll need to keep moving the mirror or adjusting your position in the shower and that can lead to potential difficulties. Light. You need to be able to see your reflection for a mirror to be effective, so look for a mirror that has a good reflective output. Sometimes a manufacturer will dull the reflective surface to increase the fog resistance of the model and that also reduces the ability to use the mirror. Adjustable magnification. Some of the top mirrors today will allow you to zoom in on a problem area so that the images reflected are closer than they appear. This will let you easily treat specific problem areas, like an ingrown hair, in an environment that is conducive to these sometimes painful jobs. Break resistance. Even the best suction cups or mirror hangers will fail over time. When that happens, you’ll want a fogless mirror that can stand up to the short fall. Look for shatter resistant mirrors that have a warranty on the quality of the product to maximize your long-term investment. If you’re looking for a lighted fogless mirror, you’ll end up having to purchase a product that contains batteries. The most important feature of this type of mirror is the water-resistance of the battery case. Without proper resistance, the batteries will quickly corrode and you’ll end up with a worthless product in your shower. What Are the Prices For Fogless Mirrors? Fogless mirrors run the full gambit of pricing on the market today. You can often pick up a small mirror that you hold in the palm of your hand for less than $10. You can also get a fogless mirror that is packed full of optional features, like a radio or a clock or even mood lighting, and it will set you back by more than $300. Many of the good mirrors that you’ll find today fall will cost about $30 or $40. You’ll get an item that is guaranteed not to fog, will give you a few of the features that are nice to have (like a razor holder), and will help you get the job you need to have finished completed quickly. Take advantage of programs like Amazon Prime to receive 2 day free shipping on your product as well! What Do Our Reviews Have To Say About Fogless Mirrors? Designed not to ever fog over, this fogless mirror is one of the highest rated products on the market today for one simple reason: it works well. You get three distinct finishes to help you coordinate your new mirror with your bathroom while the adjustable frame lets the mirror work for everyone in the family. Just fill up the included reservoir with hot water before hopping into the shower and you’ll get the reflection you need! It affixes to the shower with a soft silicone adhesive that won’t damage your shower – much more reliable than suction cups. Definitely a good value! Click here to compare prices and get the best deal on this mirror. If you’re looking for something that mixes quality and affordability, then this fogless mirror has the goods to deliver. It hangs from your shower thanks to a hook that you use an adhesive to affix, not suction cups. This allows you to take the mirror with you from the shower to the sink with ease if need be. The one issue with this design is that it doesn’t deliver a truly fog free experience 100% of the time. It’s a shower powered model that requires you to run it through the shower stream to activate. For the cost, however, you can’t beat the value! 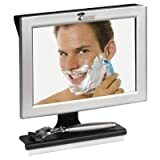 If you’re looking for a fogless mirror that can hold all of your shaving materials in one place, then this is the mirror for you. 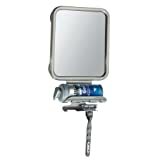 It has adjustable lights that will help you get a good reflection in even dark conditions. The shelf is curved to hold a can of shaving cream so you don’t get that annoying rust circle on your tub. It affixes with the use of suction cups and has a modern stainless steel appearance to it that works in almost any bathroom. Value priced, but delivering quality results, this is definitely a mirror to consider. Let’s face it – when you have to travel, it can be really difficult to get a good shaving experience in a motel/hotel shower. The mirrors fog up in that tiny room like nothing else and you’ve often got to keep the door closed so you don’t set off the smoke alarms. 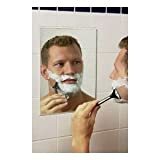 This travel fogless mirror by Shave Well effectively solves the problem for you by letting you have a large enough reflective surface to make it useable… but it is still small enough to get it packed with all your other bathroom stuff. It is unbreakable and we put that to the test by letting four preschoolers jump on it repeatedly! /easyazon_image]With a pad that heats up, you’ll get the fog-free experience in the bathroom that you need with this fogless mirror. There’s no need to apply any coatings or chemicals to the surface of the mirror to get it to work. What’s nice about this model is that it installs flush against the wall on a variety of surfaces just like a traditional mirror. It’s ideally more for outside the shower than inside, however, because it utilizes a low-voltage electrical current to charge the heating pad. It comes in a variety of sizes, but the price tag could set you back a bit. Which fogless mirror is right for you? Take the information you’ve learned today and use it to select the perfect mirror for your bathroom. Not only will your bathroom look good, but so will you!